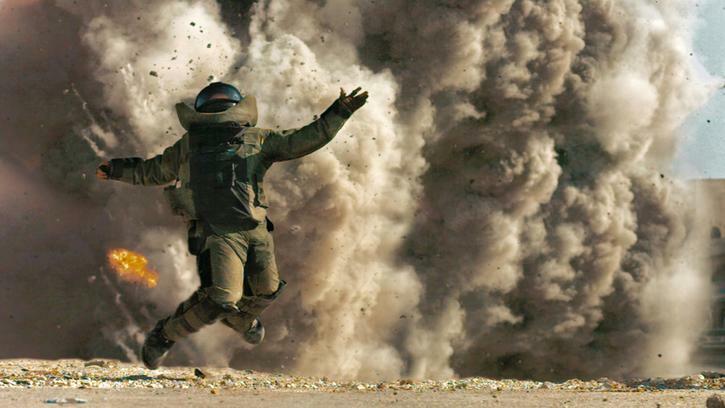 Set in Iraq but filmed in Jordan and Kuwait, the story follows an Elite US forces bomb disposal team, as they deal with IED’s (Improvised Explosive Devices) in and around the war ravaged capital Baghdad. They are kept plenty busy. The highest compliment you can play actors in a war movie, is that the characters feel real and completely believable, without question this is achieved here. In fact, in many ways the film feels like a documentary, albeit filmed in a cinematic style. Director Kathryn Bigelow knows how to put an action movie together, perhaps rightly stealing the main directing prize from her ex-husband James Cameron at Oscar time. Interestingly and most unusually, two major Hollywood actors appear and disappear with alrming speed, the only constant, Sergeant William James (an excellent Jeremy Renner) and his tight-knit team. The squad runs the gamut, from cavalier almost suicidal bravado, step up Sergeant James, to justifiably neurotic and barely holding it together, Specialist Eldridge (Brian Geraghty). The middle ground of just getting the job done, without interacting too much, is Sergeant Sanborn (Anthony Mackie). Commencing with an excellent a bomb disposal scene, where the tension is ratcheted up and the final result is superbly realised in super slow mo. The “plot” is thin, more a series of events rather than real story arc of note. However, the violence never feels gratuitous and the sense of chaos and constant threat, seeps into every frame. Some situations are somewhat surreal, which one imagines is what the situation on the ground might look like. The team providing mid afternoon entertainment for interested Iraqi’s, as the team go about their deadly work. Certainly this is not a political film in the same sense that “The Green Zone” positioned itself. More a postcard from hell, a clear situation where no-one wins in any meaningful sense. An unwinnable war, with both sides shooting at fish in a barrel. Ultimately the only survivor is the one man in most danger who is not content doing anything else, quite what that says about his character is debatable. A subplot with Renner’s character and young Iraqi boy seems somewhat tacked on to add further depth but certainly highlights how a caring viewpoint can be turned rapidly sour, given the right or wrong circumstances. A scene in the desert with Ranulph Fiennes playing, what can only be indicative of a British Special Forces team (SAS), is interesting. Showing the English highly trained soldiers to be rather incompetent and amateurish, whilst being saved by the, presumably less trained, American troops. This is a small point and overall the film “feels” real and does not dwell on the wider issues, relying on showing a “grunt’s” eye level view of what it might be like, to take on such a role in such a place. Certainly, lofty ideals of spreading freedom and democracy have no place when you may get blown to smithereens at any moment. With Box Office receipts of $48 million compared to Avatars $2.7 billion, audiences would suggest otherwise. A superbly detailed snapshot of a military explosive team in Iraq, with natural performances, superb set pieces and nail biting tension.